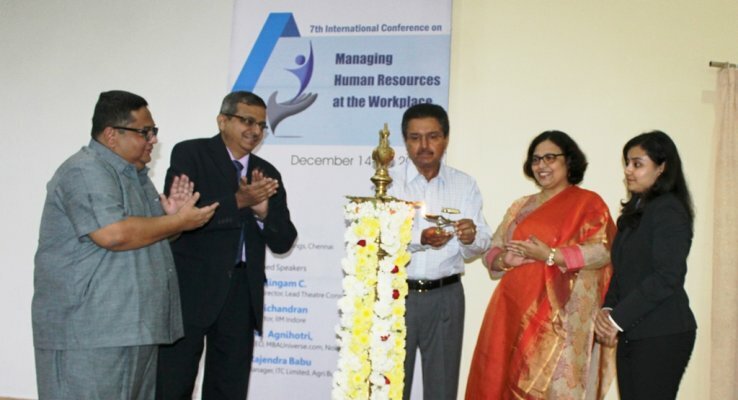 In his keynote address, Mr. L. Ganesh threw light on the importance of human capital in any organization. He said that the key challenge was to bring people with different mindsets and aspirations to work together and align the same with the organisation’s goals and objectives. Director of the Institute Dr. N.R. Parasuraman; Conference Chair Dr. Mousumi Sengupta; and Conference Co-Chair Dr. Nilanjan Sengupta; were present. The conference had technical sessions delivered by Mr. Amit Agnihotri, Founder of MBAUniverse.com and Convenor at Indian Management Conclave; Prof. Ravichandran, Ex-Faculty, IIM Ahmedabad; Mr. Rajendra Babu, Factory Manager, ITC limited Agri-Business Division, Mysuru; and, Mr. Mahalingam C, Managing Director, Lead Theatre Consulting, Bangalore. The conference deliberated over 100 research papers by over 150 delegates including academic practitioners, research scholars, industry experts and management students, to emphasize the role of Human Resources as a strategic business partner and a key differentiator in today’s volatile business environment.